Silver Cigarette Box, mounted on a wooden plinth. Kent senior recurve archer scoring the greatest number of hits. 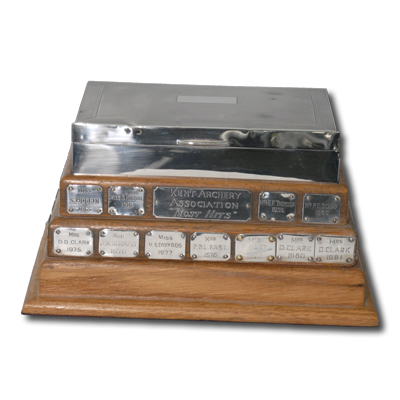 31 Aug 2013: The award criteria are such that the winner is very likely to have already been awarded a trophy as either the highest scoring Kent or visiting recurve archer. Although aesthetically pleasant, the nature of the trophy is no longer considered acceptable, because of the association with tobacco products. Ties will be resolved on the basis of highest score, then the greatest number of golds.